Volvo is working on a project that it hopes will make the job of garbage pickup safer and easier for sanitation workers. If successful, it will also reduce the number of workers required to complete each route. By automating the truck’s bin-to-bin travel, the worker doesn’t have to continually get in and out of the cab to arrange bins or manually load them into the back of the truck. The truck essentially drives itself, freeing the driver up to handle other important tasks safely. Today in the United States, many sanitation trucks are fitted with an arm that picks up specially-designed cans and dumps them into the back before placing them back in position. A human driver is required to steer the truck into place and deploy the arm. Another human occupant is required to correct any bins that are improperly aligned for the mechanical arm. Many departments still have manual trucks that require sanitation workers to lift trash bags/bins and empty them by hand. This means getting in and out of the cab or riding on the back with only a handle to keep them on board. An automated, self-navigating truck means less manpower required to complete a route. It also puts less strain on the arms and knees of workers as they won’t have to continually enter and exit the cab or cling to the back of a moving truck. The Volvo Trucks include similar self-driving sensors and to the ones you will find in autonomous cars being developed. Using GPS and sensors, it maps out a new route the first time it is taken through a neighborhood. After the first initial introductory route, the truck is able to learn the route, including any obstacles or stops it needs to make. The driver then can step out of the cab and, with the push of a button, direct the truck to drive to the next house. The truck will then drive itself to the destination without any need of human intervention. If a new obstacle appears, it will identify it and navigate around it. The driver can essentially follow the truck through the neighborhood on foot, emptying bins or arranging them as needed. No more endless climbing in and out of the cab at every stop. 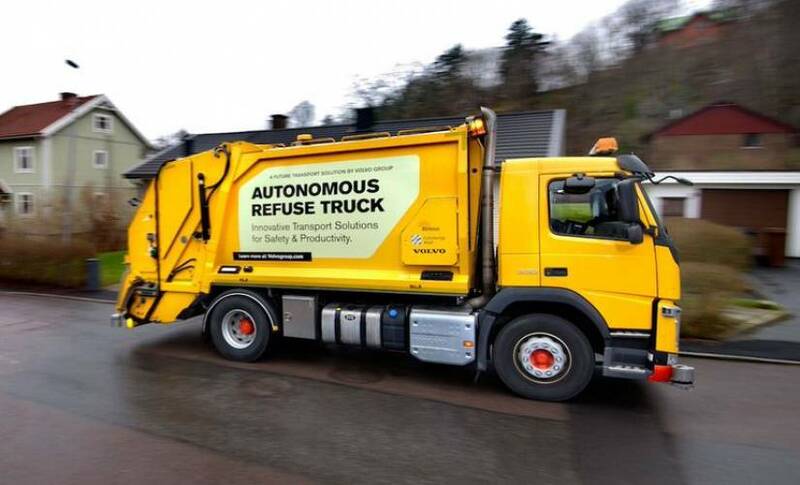 Unless you live in Sweden, you probably won’t see Volvo’s autonomous refuse truck driving down your street any time soon. For now, it remains a pilot program in coordination with Renova, a Swedish waste management company. This pilot is expected to run throughout 2017. Additional research and development is expected for the next several years. After that, you might just start seeing a garbage truck without a driver in the cab stop in front of your home.